Talk to your office managers today! season, and how you can too! We want YOU to help us put a smile on the faces of hundreds of children this holiday season. To maximize the reach of potential donations, BlackNLA.com is seeking participation of businesses and individuals to organize their staff, fellow co-workers, friends, clients and others in the surrounding areas to participate. If you work at a company with 30 or more employees - a box can be placed in your lunchroom or lobby. If you have a company that gets repeat client traffic - a box can be placed in your lobby. Businesses participating as drop-off locations will be listed on our toy drive page and included in e-mails to be distributed to over 26,000 Los Angeles area companies and professionals. If you work at a company with items to donate to the youth - toys as well as personal hygiene and clothing are needed. If you work at a company with items that can be raffled off at various toy drive events (tickets, electronics, services, products, gift cards etc.). Funds from the raffle are used to purchase toys and gifts for the Toy Drive. If you belong to a alumni or association - organize a group donation day among members, or co-host a BlackNLA Holiday Mixer. If you host events and can host a Toy Drive event. Do you have unused gift cards? We can use those to purchase gifts. Don't have time to shop? 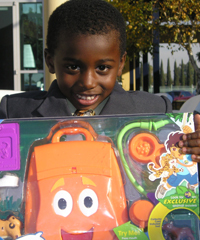 Contribute to our toy drive fund with a cash gift and we will shop for you. Click Here to make your gift. Volunteers - Do you have time to deliver boxes to businesses? Contact companies and organizations? It takes a small village to run the toy drive we are looking for volunteers. 'For more information and additional ways to help this year click here. Those interested in participating in this year's Toy Drive should contact BlackNLA.com by phone at (323) 954-8988 or e-mail toydrive@blacknla.com. 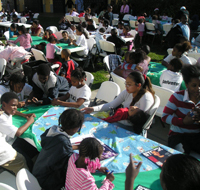 Last holiday season, BlackNLA members, website visitors and corporate contributors teamed up to provide toys, books, games, clothing, toiletries, electronics, CDs, videos, and other suitable gifts to more than 800 children in the LA area. This is a grassroots community program designed to provide gifts for children and teenagers up to age 17. All donations, large and small, put some cheer into the holidays for a child who may otherwise not have received any gift at all. Let's all work together in making this year's toy drive the most successful ever!! !